Welcome back to Something About Coins! 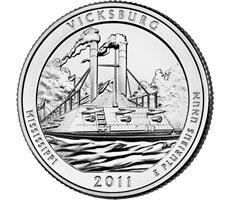 The U.S. Mint is releasing the Vicksburg Silver Bullion Coin on June 20 but only to their authorized purchasers. Over 20,000 collectors bought the Yosemite 5 oz silver uncirculated coin last week. The U.S. Mint's 9/11 silver medal will launch on June 20. Panda coins have been targeted by counterfeiters. Commemorative half dollars and items in the big Baltimore auction were reviewed by two experts. Enjoy!